Garth Brooks has made it big on the country music scene and is one of the most successful male singers in the music industry. 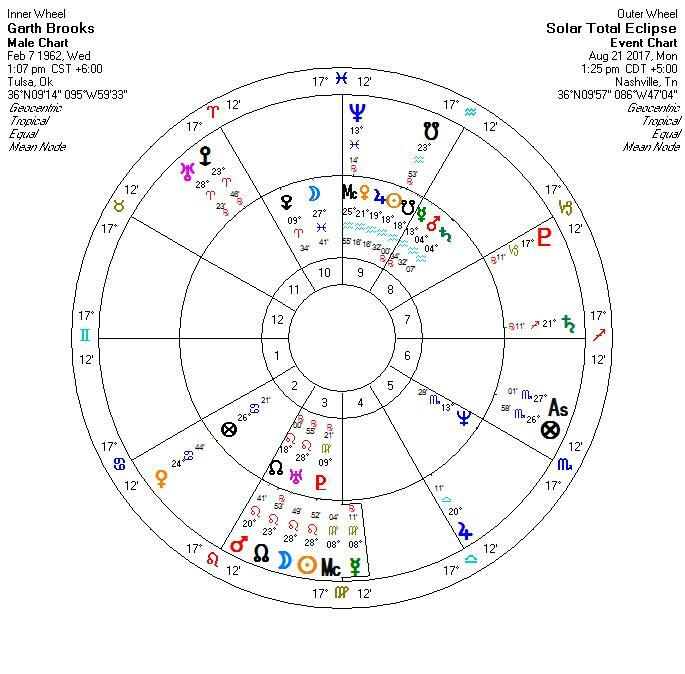 He has a most unusual chart in that he was born during a rare stellium of planets in Aquarius namely, Mars, Saturn, Sun, Venus, Lunar Node, Jupiter and Mercury. He has an excess of Aquarius characteristics. Aquarians are unconventional and original in their ideas. In youth they can be rebels, brilliant, and have concepts that are 20 years ahead of society. They are attracted to sports that give an adrenaline rush like down hill skiing, racing cars, or rock climbing. They can be technology fans of the newest and best in computers or electronics of any kind. He doesn’t look Aquarius or Gemini rising. They are very often tall and thin with an extra long face that seems like a narrow rectangle. Aquarius usually has a thin, lean body but Garth has a thick stocky body that suggests that he could have an earth or water sign rising. The most likely cause of his tendency to be overweight is the Part of Expansion (Jupiter) is on his Ascendant. At one point he weighed 300 lbs. That would give him a a believe in abundance toward life and food. His Moon is in Pisces in the 10th house that could contribute to his stockiness. He does earn his money as the MOST successful country singer. He is noted for his attention to clothing and fashion. He designs his own shirts and now has a line of clothing based on his designs. This is a Virgo-Mercury characteristic. Virgo is associated with the fashion industry and his only connection to Virgo is Pluto in the third house. He does have Moon in Pisces which gives him emotional talent in his career house in the 10th. He is known for his nice, country boy manner publicly but he is very different business-wise. He has degrees in marketing and advertising so he runs his entire career without a record label and finances all his projects. He is noted for his business acumen. 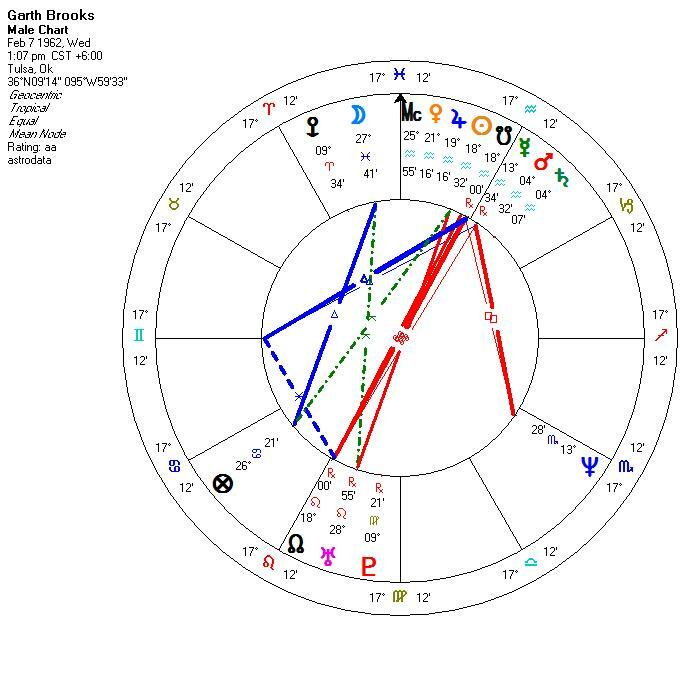 Beginning in 1996 and continuing through the beginning of the next century, transiting Uranus will be passing through all of Garth’s Aquarian planets. This should be a period of great change, originality and turmoil for Garth as he attempts to alter his life patterns by eliminating the old and worn out parts of his life with new ideas and risk taking. This can make for a bumpy road but he could keep his presence on the stage fresh and new for his fans. Behind the stage, life can get uncomfortable with such a long series of changes. With Garth’s Aquarian nature, change is exhilarating and it energizes him. He disappeared from the music scene for several years, divorced his first wife after an affair with a woman singer. They are an couple and perform together but have not tied a marriage knot. Probably because he split half his assets with his first wife. As far as I know he is the most famous of the ‘Aquarian Children’ born in February 1962 that got so much attention by astrologers. He has very strong major change aspects this year during the summer of 2017, especially in August during a major solar eclipse. His ruling planet Uranus in Leo is being aspected by this eclipse and transiting Mars. They all oppose his Sun so major change is in the air. More change is likely with the next eclipse in February 2018 before his life settles down and what he wants is completed.